After the Ascension of Jesus, St. Peter proposed to the assembled faithful that they choose a disciple of Christ to fill the place of the traitor Judas in the first missionary band. Lots were drawn, with the result in favor of Matthias. According to one ancient tradition, this missioner labored in Ethiopia and was martyred there. 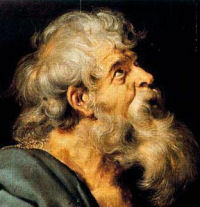 Thus did St. Matthias receive "the crown of life which God has promised to those who love him." The Church venerates St. Matthias on an equal footing with the other Apostles, whose voices resound throughout the world, from generation to generation, giving testimony of what they saw and heard in their life with our Lord. His name is mentioned in the Canon of the Mass. According to the 1962 Missal of Bl. John XXIII the Extraordinary Form of the Roman Rite, St. Matthias' feast was celebrated on February 24 or 25. Today is the commemoration of St. Boniface who after a stormy youth, was converted to the Catholic faith, suffered numerous tortures, and was beheaded in 307.